Most of us know what the Medal of Honor is and why only a few receive it. Unfortunately, many receive it posthumously, having sacrificed their life to save others. Recipients still alive are few in number and like real heroes, wish to honor others who deserve recognition for heroics. 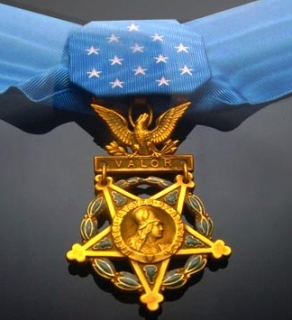 This blog was among many that posted last year of the Medal of Honor Society search for others in civilian life who have bravely risked their own lives to save or benefit others. Hundreds of heroes were recommended, but only a few selected as semi-finalists and now, four have been selected to receive the Citizen Service Before Self Honor from the Medal of Honor Society. Amongst finalist is 15 year-old Marcos Ugarte of Troutdale, Oregon who risked his own life to rescue a smaller boy from the second floor of a burning home last year. It takes ordinary people doing extraordinary things in order to be a recipient of the nation’s highest honor for bravery, the Medal of Honor. Millions of men and women have served in our wars and performed heroically, but out of those millions, only 3,471 have received the nation’s highest honor. Of that number, less than 100 are alive today. Ordinary people who, when it really counted, ignored the dangers and placed their own lives in jeopardy, heroically saving others. We look upon these Military men with awe, many of us wondering if we would act as they did in the same situation. Most of them look upon themselves as the lucky ones, the ones that survived the battles, many thinking others are more deserving of the honor. But heroes are not restricted to the Military in battle nor are all heroes only men. We pass heroes every day in our cities, most often not seeing a hero, but a Fire Fighter, a Police Officer or just a friendly neighbor who responded to calls for help, ran into a neighbor’s home on fire to get people out before First responders arrive.